The raw and majestic mountain chain of the Caucasus or Large Caucasus is divided into three parts - West Caucasus - from the Black Sea to Mount Elbrus, central Caucasus – from Elbrus peak to Kazbek, and East Caucasus, which stretches from Kazbek to the Caspian Sea. Along with the highest in Russia and Europe Mount Elbrus (5642 m), another handsome mountain is Mount Kazbek, rising to 5047 m altitude. Above 3300 meters the slopes of Kazbek are covered with eternal snow. It passes through the top Russian-Georgian border. Routes of varying complexity enjoy great popularity among both mountaineers and tourists. 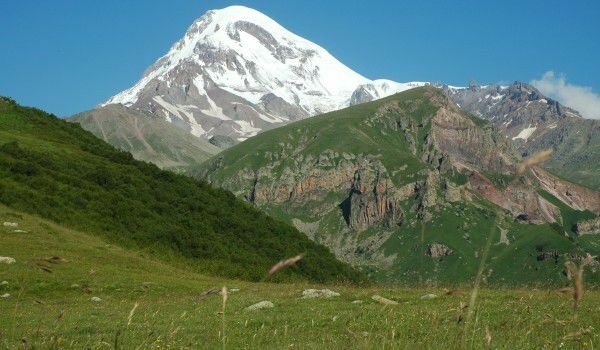 Kazbek is one of the most beautiful and highest peaks in the Caucasus. It is located in the eastern part of the Central Caucasus, in Georgia, near the border with Russia. Its Georgian name is Kazbek Mkinvartsveri, which translates literally as "Mountain ice peak" and has the Ossetian name Urshhoh, which means "White Mountain". Kazbek is celebrated not only as a valuable natural resource and mountain, but also as an important historical area. From 1979, the Kazbek region was designated a national park because of its valuable beech forests, subalpine forests and alpine meadows. Many plants and animals in the reserve are endemic to the Caucasus region. The first ascent of Kazbek was done in 1868 by a group led by the famous British mountaineer and adventurer Douglas William Freshfield, which is one of the most prominent and most active members of the Royal Geographical Society, one of the founders and most zealous propagandists of Alpine virtues of the Caucasus. The other players in his team are Adolphus W. Moore, Comyns C. Tucker and the Swiss guide Francois Devouassud. The group draws for the first time in the Caucasus region and reaches the East Elbrus, thinking that they were the first people to climb it. In the popular book "The Exploration of the Caucasus", Freshfield details this journey: "extraordinary concentration of great ice peaks from one to the other end of the horizon and all unconquered! This is something radically different from the already well-known Alps. " Russian surveyor Andrey Vasilievich Pastuhov (1860-1899) was the first researcher who came to do geological and meteorological research in Kazbek. This was in 1889 and his Ossetian leader displays their flag on top of Kazbek. It was said that in good weather this flag can be seen from Vladikavkaz, which is today the capital of the Republic of North Ossetia - Alanya, which in turn is part of the Russian Federation. A large number of legends float around beautiful Kazbek, which probably are associated with many unique historical monuments that are located in the area. One of them is aimed about 3800 m high, on top of a 80-meter cliff – the ancient cave monastery of Bethlehem. According to some old writings, the monastery was the repository of a sacred and religious treasure. The story tells how St. Joseph, following God's will, climbs to the monastery and gave King Heraclius a piece of the tent of the Old Testament patriarch Abraham, considered the father of the Jews and Arabs. In distant ages, monks reached the monastery, climbing on a metal chain. On the slopes of Kazbek, on the side of Daryyalskoe ushtelye at 3600 m is a meteorological observatory, part of which is used as a hut. Another legend tells of a local version of Prometheus, called Amirani. Amirani stole fire from the gods to give it to people and as a sign of anger, they chained him to the rocks of Kazbek. A Dragon, seeing Amira, descended to deal with character him. However, it petrified and so came about the Dragon Rocks. This landmark is located at 4800 m height and recreate a giant horseshoe shape with a length of 1 km.